FloorTech Group – No Waxing. No Staining. No Scratching. For Life. 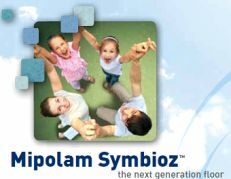 Some months ago, we mentioned Gerflor’s product, Mipolam Symbioz in our Bio-Based Tile post. What we didn’t effectively highlight is the “green” component inherent in the maintenance characteristics of this amazing material. Symbioz, a 2-meter wide sheet vinyl, can and should be used in any high traffic area, but particularly in Healthcare, Senior Living and Retail environments. Symbioz is constructed from a 100% bio-based plasticizer – and includes an unbelievable 75% overall composition of renewable and sustainable components. 2mm thick (equivalent to standard 1/8 gauge), like most all of the homogeneous commercial sheet vinyl products available, Symbioz is the lightest (by weight) product on the market – and thus, should incur the lowest transit costs, which contributes to a smaller environmental footprint. It’s less expensive than what you’re probably using now.